Team LNT has ‘agreed to release Warren Hughes to pursue a seat with a prototype team’ at Le Mans, so the third seat in the orange Panoz goes to 21 year old Tom Kimber-Smith. He’ll drive the #81 Esperante with Lawrence Tomlinson and Richard Dean. 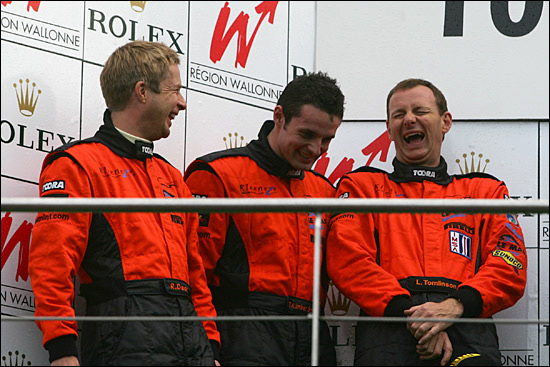 “Warren was originally set to drive the Panoz and bring his considerable Le Mans experience to the team, but we have agreed he should be able to pursue his ambition in the top classes for a potential win overall,” explains Richard Dean. “Tom has really progressed so quickly in sports cars this year with his performances at Sebring, the British GT Championship and only this month with a great drive to help the team to second place in the Le Mans Series at Spa-Francorchamps,” adds Group LNT Chairman Lawrence Tomlinson. The Dean / Tomlinson / TK-S trio came through to an excellent second place at Spa. The damaged car from Spa has since been back to Atlanta for repair, and will then be fully rebuilt when it returns to the team. For Tom Kimber-Smith, it’s been a whirlwind two and a half months – since his maiden GT race at Sebring.